COLUMBUS, Ohio – The No. 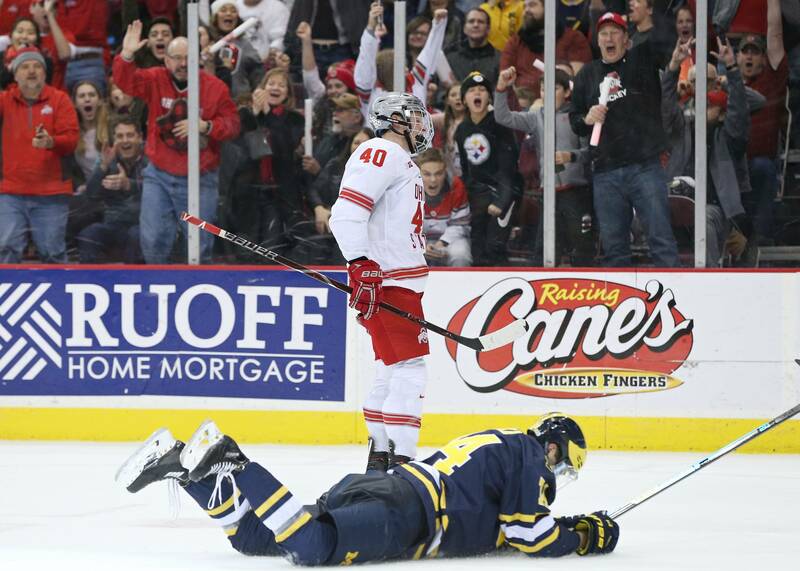 4/3-ranked Ohio State men’s hockey team scored three times in the final 10:44 of the third period to defeat Michigan, 4-2, Saturday in Value City Arena in front of 9,857 fans. The Buckeyes improve to 13-5-4 on the year and 6-3-3-2 in Big Ten play with the win, while the Wolverines are now 8-9-6 and 4-5-4-2 in the league. The Buckeyes and Wolverines were tied at one after the second period, with Tanner Laczynski scoring for Ohio State, and Michigan went ahead at 8:48 of the third. Just 28 seconds later Buckeye junior Wyatt Ege tied the game and at 13:03 freshman Quinn Preston tallied the eventual gamewinner. Ronnie Hein sealed the win with an empty net goal. Ege and Laczynski both added assists for two-point nights and Mason Jobst had two helpers. Ohio State hits the road next weekend for two games at Penn State. The teams will meet at 7 p.m. Friday and Saturday, with the games on BTN Plus and Ohio State radio. In the first … Neither team scored in the opening 20 minutes, with each team 0-for-1 on the power play. Shots were 7-6 in favor of the Buckeyes. In the second … Two power play goals in the middle period sent the teams into intermission tied at one. Ohio State opened the scoring at 10:30 as Tanner Laczynski scored his seventh goal of the year. On a 5×3, he one-timed a pass from Mason Jobst into the top corner. Matt Miller also assisted on the goal. The Wolverines tied the game at 14:36 when Will Lockwood scored. Ohio State had the advantage in shots, 11-9, in the period. The Buckeyes were 1-for-2 with the man advantage and the Wolverines were 1-for-1. In the third … Michigan went ahead 2-1 at 8:48 of the third on Jimmy Lambert’s goal on a rebound. Just 28 seconds later, Buckeye Wyatt Ege deadlocked the game at two. He carried the puck around the zone before putting a shot far side. The goal was the first for Ege as a Buckeye and Laczynski and Freddy Gerard assisted on the tally. At 13:03 Buckeye rookie Quinn Preston put Ohio State in the lead, dragging around the defenseman and scoring short side. Mason Jobst and Ege had the helpers on the tally, Preston’s fourth score of the year. Michigan pulled its goalie with more than a minute remaining and the Buckeyes were able to hold the lead. Ronnie Hein pressured a Wolverine into a turnover in the neutral zone and scored into the empty net to seal the win. Buckeye goalie Tommy Nappier had 12 saves on 13 shots in the period and Ohio State put four shots on net. There were no power play chances. Shots … Ohio State was outshot, 28-23, in the game. Nappier played all 60 minutes and had 26 saves for the Buckeyes, improving to 8-1-2 on the year, with a 1.58 goals-against average and .945 save percentage. Michigan’s Hayden Lavigne made 18 stops in 57:53. Ohio State had 12 shot blocks, led by Preston with three and Sasha Larocque and Tommy Parran with two each. Special Teams … The Buckeyes were 1-for-3 on the power play, with Michigan 1-for-2.